Formed in the aftermath of Hurricane Sandy, Powered for Patients is working closely with public health preparedness leaders, emergency managers, utilities, healthcare facility managers and power generation industry leaders to help safeguard backup power and expedite power restoration for critical healthcare facilities. Powered for Patients is also working with these and other stakeholders to help address the needs of at-risk citizens dependent on electric-powered medical equipment during prolonged power outages. 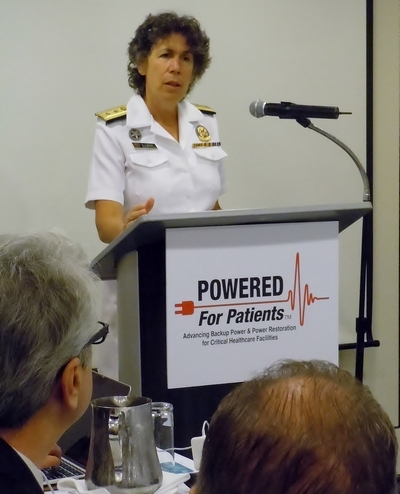 The success of Powered for Patients has come in large part from the initiative’s ability to bring critical public and private sector stakeholders together for vitally important discussions and much needed collaboration. Funding for the initial Powered for Patients Stakeholder Meeting was provided by the Department of Health and Human Services, Office of the Assistant Secretary for Preparedness and Response (ASPR), through a cooperative agreement with the Association for State and Territorial Health Officials (ASTHO). Other federal agencies participating in the meeting included CDC, FEMA, the Department of Homeland Security, the Department of Veterans Affairs, and the Department of Energy. Powered for Patients has since received funding from the U.S. Department of Homeland Security through a grant provided to the Rhode Island Emergency Management Agency that enabled the launch of a stakeholder engagement initiative that culminated in the production of Protecting Patients When Disaster Strikes, a Playbook on safeguarding emergency power and expediting power restoration. Powered for Patients has also worked closely with the American Society of Healthcare Engineering (ASHE), a personal membership group of the American Hospital Association. The two organizations published Roadmap to Resiliency in 2017, a white paper detailing the advanced technologies available to safeguard emergency power.